Werewolves are humans infected with the supernatural Lycanthropy virus. The virus re-writes their DNA causing transformation into a monstrous wolf like humanoid during all nights a full moon is present regardless of cloud cover. Although their strength, speed, and aggression is lessened by a thick cloud cover. A full moon in terms of werewolf transformation is defined as 80% or more of the moons surface illuminated by the sun. However this is only the minimum requirement, and only a small number will transform. Generally the newer Werewolves will transform unwillingly the most. With age resistance is formed, and more Moon illumination is required to achieve Lycanthrope status. With each percentage point of Lunar lighting the number of Werewolf transmutation increases greatly to it’s peak at 100% full Moon. Werewolves can transformation as the sun sets sometime within Nautical Twilight if the moon is visible. Since there is still daylight the minimal sunlight will cause them to stay in deeply wooded areas or even caves. The vast majority of werewolves reside within Astronomical Twilight where their power is strong. The peak of their power comes at Midnight otherwise known as the supernatural witching hour. The subject remains a werewolf until nautical twilight just before the sun rises. The rising sun triggers the de-transformation back to their human form. The sun in general blinds the werewolf and renders it helpless. However it will not burst into flames like a vampire in sunlight. Werewolves are extremely agile, and run about in an ape like way utilizing their arms as legs. They possess strength comparable to at least two large polar bears with a speed greater than that of a wolf (66 mph). Their carnivorous teeth are as sharp as diamonds and tough as steel. When in human form during the day they possess strength and speed above that of the average human and would be classified as superhuman. At night in human form in the presence of non-full moonlight they can have double or even triple the strength and speed of the average person. These superhuman abilities are the first clues that something has happened to them along with waking up naked and sometimes bloody from the previous nights hunt as they have no memory of being a werewolf. Generally if a person has a strong will of goodness, which is rare, their werewolf persona will mainly target animals rather than humans. There’s also an attraction to other supernatural creatures. If presented with a paranormal being or a human, the Werewolf will always go after the supernatural entity. Those human Werewolves that are evil will be some of the most horrid creatures ever and will go after any living thing. Those in between will probably go after animals and adult humans. However what little humanity shines through may prevent them from harming children. There are also rare cases of exceptionally strong willed people controlling their transformations to the point of being able to transform without a full moon. Some reports also indicate that a rare few have achieved human consciousness in werewolf form. The longer they live, the better control they have. Werewolves are created when a werewolf bites a human thereby transferring the supernatural lycanthropy virus into the victims bloodstream. From there it makes it to their cells where the DNA is altered and lies mostly dormant until a full moon. 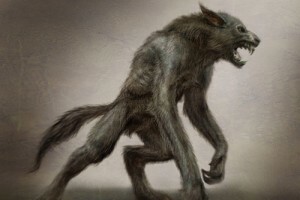 There is currently no cure for Lycanthropia aka Werewolf Syndrome, however if they were just bitten it is possible to reverse it with magic or religious remedies. The afflicted individual can take steps to insure people don’t get hurt. 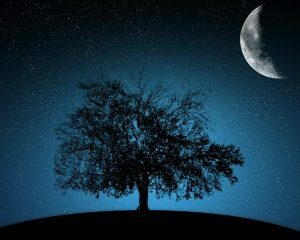 Many who realize what’s going on choose to lock themselves away on full moon nights. There’s also evidence that some witches and wizards can temporarily de-transform a werewolf although they are by no means cured of the disease. Werewolves are not immortal as they are still human and therefore age. However each monthly transformation regenerates the body to an extent so they will have double the life span of a normal human. It’s pretty common for a human with Lycanthropia to live for 175 years. The highest known age for a common Werewolf is 251 years old although it is rumored that a small number have utilized magics to attain immortality so there might be werewolves roaming the Earth who are thousands of years old. The humans with werewolf syndrome can still have kids and they will be perfectly normal. In fact it’s pretty much a guarantee they will be free of birth defects and not have any negative genetic factors. There are hereditary Werewolves who pass down the Lycanthrope gene to their offspring, but that isn’t as common as people who are simply bitten. They don’t pass along anything paranormal to their kids. In werewolf form it is possible for them to mate with another werewolf but a male werewolf running into a female one is beyond rare. The resulting pregnancy would cause the female to stay in werewolf form for the one week gestation period. She would most likely find deep forest cover, a cave, or bury herself in the ground until the unholy birth. The werewolf child would be a rare pure blood werewolf that has no human form and would become an adult within a week. It would be born an albino and would be beyond ferocious. Although it’s strength and aggression would be somewhat beholden to the full moon, it would constantly be in werewolf form most likely hiding during the day in a dark cool place. Albino werewolves cannot mate nor does their bite create another werewolf. In fact it’s mere bite would kill a human. Albinos are the only true immortal werewolves and will live forever until killed. Werewolves can be killed with silver bullets, silver stakes, any sharp silver implement including silver swords although being beheaded by anything tends to finish off just about any supernatural creature. Since they are still human beings we recommend saving this for a last resort. Once they’re killed they will return to human form and you could be charged with murder. If attacked we recommend a full power taser which will stop it for a matter seconds or a tranquilizer gun loaded with elephant tranqs or something containing the right amount of Wolfsbane, and minute amounts of silver or colloidal silver. Wearing anything silver in general, especially a cross, will deter them along with holy water. Wearing the flowering herb Wolfsbane in various forms is also a highly effect deterrent. They can be scared off like most animals with bright lights, and loud noises. Dog whistles of a certain pitch have also been some what effective in scaring off most werewolves but a Werewolf Whistle is the safest bet. They are also attracted to bright colors so dark clothing is recommended. Especially in the wooded areas they are drawn to. Certain holidays like Christmas & Easter can nullify werewolf transformations due to the forces of good being marshaled in full force. Holidays like Halloween on the other hand can intensify werewolf activity and power due to the forces of evil marshalling their power. Certain holidays and types of moons can also effect werewolves. For instance a Supermoon creates a hulked out mega aggressive werewolf while a Friday the 13th full moon can cause a demonic werewolf who is possessed by a demon from hell. See the chart at the end of this page for more details on the various monthly moons, celestial events, and holidays effects on Werewolves. Some in the paranormal community will hunt werewolf for sport and experience the ultimate rush. A fringe few will actually eat the beast alive since death would cause it to return to human form. They believe it has magical properties of rejuvenation and strength. 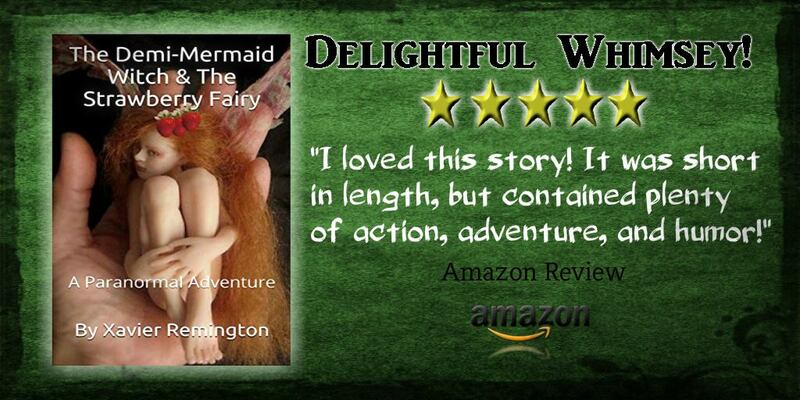 The majority of supernatural hunters try to tranquilize and capture the hairy horrors until they return to human form. Killing Werewolves is saved as a last resort to protect innocent lives. Some Wicca spells call for Werewolf hair which is believed to possess magical properties and has been used for centuries in various primitive cultures including Native Americans who comprised the first werewolves in North America. Werewolves are thought to have originated with a group of Pagan Celts practicing extremely dark witchcraft in Iron Age Great Britain. The ancient British Isles were teaming with large blood thirsty wolves which were caused by Hellhounds biting a common wolf. The Hellhounds themselves were released from the Underworld, the physical extension of hell on Earth, by a coven of dark witches who had a sinister plan in mind. A plan of revenge to curse as many humans as possible for the death of fellow witches. The ancient people eventually turned these dark practitioners of Witchcraft for help. Unfortunately the people were fooled into thinking they were good witches. A diabolical demonic ceremony took place at Midnight in the light of the full super (closest to Earth) blood moon (First full moon after the Autumnal Equinox Harvest Moon) amid an eclipse at Stonehenge. The dark witches tricked the people into making two human sacrifices. Sacrifices that had to be made willingly by the subjects, and the villagers as well. A young male and female virgin were tied to a stone altar. One on each side of another alter containing a live Hellhound infected wolf tied down with silver chains. The deeply Devilish and demonic ritual took place as the blood of the virgins was mixed with that of the wolf who was slowly being bled to death while at the same time being fed said blood. The wolf died but then was resurrected containing the blood of humans and the spirit of a demon who possessed him. He was then unleashed as the lunar eclipse began and killed all the humans observing the ceremony before finally biting the two dead human virgins at the apex of the lunar eclipse. After ingesting the blood, the huge wolf transformed into the familiar monstrous humanoid form of the Werewolf. As the eclipse cleared to reveal the full moon again the two sacrificed virgins were resurrected and transformed into the first real werewolves and ran off into the night to wreak havoc on the nearby village killing nearly the entire population. The full moon that night indeed turned blood red. The only survivors were people bitten, and infected with the Werewolf syndrome. The two Werewolves mated that night and within a week the first pure blood Albino werewolf was born. The female stayed in werewolf form for the week’s pregnancy while the male returned to human form the following morning to find his entire family and village slain in a bloody catastrophe. He had no idea what had happened but transformed on the other nights of the full moon during that week. He moved on to other villages, and decimated the populace turning some into fellow Werewolves. He finally realized his black outs, and the mass deaths were connected. Now in human form he sensed the birth of the albino Werewolf, and found his mate in Werewolf form giving birth. The small white cub ran about the woods while the man witnesses the female return to human form. He then realized the demonic curse he was under, and that he was now a hairy serial killer. He, and the woman sought shelter that night to discuss the situation when all the sudden their albino son burst through the door, and mauled both of them before racing away. The bite of the albino transferred an unknown virus, and the first Werewolves become the first Lycans. A rare species of powerful Werewolf who manifest an almost vampire like appearance in human form while able to transform into a wolf man like creature at will without any need for a full Moon. Although the full Moon gives them more power. No matter what form they were in, they had complete awareness of their actions, and their lust for blood, and flesh took over as they embraced their new lives. Unlike common Werewolves, Lycans are in fact living dead, and are therefore immortal. The two Lycans mated, and were able to bring forth offspring. However they could only bare one child who was born within a week but took a half century to grow into adulthood. It wasn’t until a century later that they ran across other Lycans who were Werewolves bitten by the Albino. Their son was then able to mate, and slowly the Lycan race grew. At the height of their population they had a run in with powerful vampires, and many Lycans were eradicated. From that point on they hid themselves, and are almost impossible to find in modern times. They considered themselves Werewolf royalty but have no real power over Werewolf packs across the globe. When a Lycan bites a human they don’t create a Lycan but rather a common Werewolf who retains human consciousness in Werewolf form. It’s rumored that the Lycans want to amass an army of these Werewolves to attack vampires, and the world. In human form these Werewolves remain under the Lycans control through a form of hypnosis. The demonic wolf aka the proto-werewolf who created the original two, was angered by being trapped in the wolf body by the dark witches. He attempted to hunt them down but only got a few of them. He also managed to turn some into the first Werewolf Witches, an extremely rare, and powerful form of Werewolf. The demon was trapped within wolf form by magic and he knew if he were to die then his spirit would be eradicated for all eternity. So the immortal demon wolf stalked, and killed witches all over the Earth. He also continued biting humans, and transmuting them into Werewolves. Only humans bitten by him have the Werewolf gene which they pass down through the generations. These First Generation Werewolves who are more powerful than common Werewolves. Eventually the demon wolf made it to North America where he came across Native American witch doctors who utilized special magics, and the mystical power of Sasquatch, a friend of the Indian, to deter him. The demon wolf, and the natives he turned into Werewolves menaced the various Indian tribes. Finally several Witch Doctors gathered together, and managed to kill the demon wolf in a ritual spiritual ceremony that ended up creating Indians who could transform into large wolves at will. On the full moon however they transform against their will into full blown Werewolves who still have somewhat of their will intact. Although they are not fully conscious humans. These Native American wolf packs protected their tribes from the mindless Werewolves, and other threats. To this day there are Native American werewolf packs that can transform into werewolves at will without the full moon. Sometimes they are good and sometimes they are evil. Certainly something to think about next time you gamble at an Indian casino. Other ethnicities also have werewolf packs although the lone Werewolf is more common. Pack always are the type who can maintain their conscious or some semblance of their will when transforming into Werewolf form. Sometimes they have the ability to transform at will or are beholden to the Moon. It depends of who they descended from, and if they can get a witch, wizard, or sorcerer to aid them in controlling their Werewolf nature. Packs have a leader called an Alpha, and a second in command called a Beta. 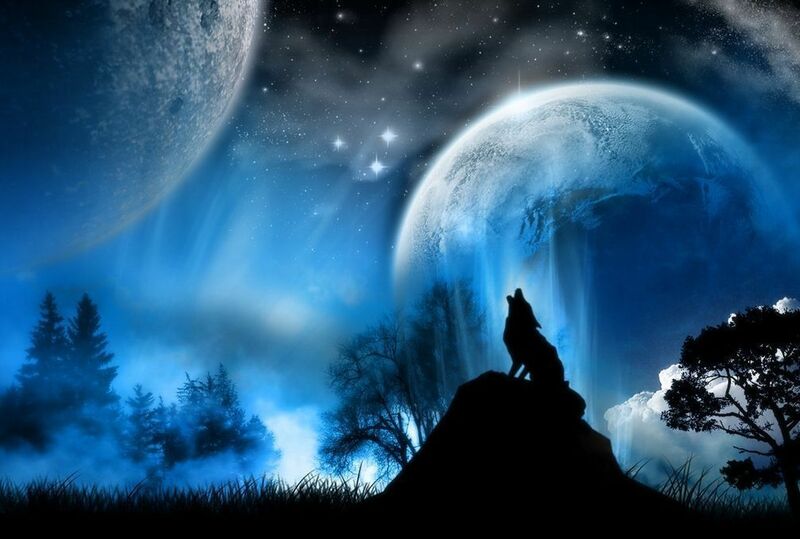 January – Wolf Moon – High werewolf activity after Christmas dormancy. Most Werewolves are loners but during this particular Moon those in the same general area will no longer attack each other. They will form packs, and instinctively choose an Alpha Leader. There are however those who are members of Wolf Packs all year long. Mainly in the Native American community that embraced the Werewolf menace hundreds of years ago to make it their own. Native Americans, and others who have the power to control their transformations, and maintain all, or at least a good portion of their human persona in wolf form, tend to form packs. February – Ice & Snow Moon – The month of frigid ice and snow ridden hell. Fortunately no real ill effects that would increase the Werewolf threat to humankind. When falling on or close to Valentine’s Day some Werewolves may not transform while most will have increased libido leading to a chance of the birth of a soulless albino Werewolf without human form. March – Storm Moon – Werewolves will tend to be more aggressive during March storms whether snow or rain. However the luck of Saint Patrick’s Day, and the Spring Equinox helps protect humans from the Werewolf menace. April – Pink Moon – Less aggressive werewolves, second only to the Yule Moon, courtesy of the Easter Spirit. May – Hare Moon – The Moon of fertility also called the Full Flower, Milk, Planting , or Mother’s Moon. This Moon greatly increases Werewolf libido which in turn brings danger of a rare Werewolf mating. Generally fully transformed Werewolves will attack each other. If they should mate a deeply demonic soulless albino Werewolf will be born devoid of a human form. These are the most monstrous of Werewolves second only to demonically possessed Werewolves. June – Honey Moon – Carnivorous nocturnal supernatural bees will follow select Werewolves around on the one night of the 100% full Moon, and help it hunt for prey. They will circle like tiny vultures swooping in for the meaty scraps when the Werewolf has had his fill. As dawn approaches they will descend back into the Underworld where they live most of the year. The origin of the paranormal bees link with the Werewolves is thought to be a rare pact between a faction of Earthly Underworld Gods, and Demons. Negative impacts are lessened by the fact that this is the generally the Moon closest to the Summer Solstice. July – Lightning Moon – Also called the Thunder Moon due to July being the month of the most violent thunderstorms. The most violent of thunderstorms with several lightning strikes can actually charge a Werewolf with electrical energy adding another danger to humans. On rare occasion Werewolves will acquire permanent Electrokinetic powers even in human form. August – Corn Moon – No unusual effect except for Werewolves being mesmerized by the labyrinth maize of the corn fields. If a corn field is nearby they will be compelled to run through it madly forming instinctual demonic patterns that often appear as so called crop circles. We recommend steering clear of such fields of tall foliage during the Corn Moon! September – Harvest Moon – The first full moon closest to the autumnal equinox causes werewolves to have more power due to the increased moonlight. Although it doesn’t increase aggression all that much. The harvest moon also causes them to leave the woods and prowl about farm fields. Greater chance of running into a werewolf crossing roadways or through people’s backyards. Much increased chance of contact with people which fuels their lust for blood and fresh meat. Werewolves being human in origin are naturally drawn to human meat. The big bright harvest moon is often used by farmers to continue working into the night which places them in harm’s way as well. October – Blood Moon – General increase in werewolf activity due to the demonic energies of Halloween. The hairy horrors are more aggressive and dangerous in nature. Especially considering it is the Moon of Werewolf origin. Second only to the Super Moon in individual Werewolf power. Has also been called the Sanguine Moon which is simply a fancy term for Blood Moon. The October Moon has also been known as the Hunters Moon. Especially considering the increase in paranormal activity means an increase in supernatural hunters. Particularly those seeking Werewolf meat, and trophies. November – Dark Moon – The forces of evil ride high on the power of October’s Halloween Blood Moon as the landscape reflects their dark death. The last sprigs of life, and festive colors of autumn die away leaving a brown barren countryside eagerly awaiting the power of Christmas Yule Moon goodness. Werewolves will be more aggressive than usual before the December lull in their hellish activity. The November Dark Moon is not to be confused with a standard Dark Moon, aka a New Moon. This Moon still has light but it’s energies are dark second only to the Blood Moon. December – Yule Moon – Halts Werewolf transformations in some cases. If they do turn then they will be white albino docile werewolves who will only forage for plants, and not attack anyone. This annual lull in werewolf activity is thanks to the power of the Christmas Spirit, and the Winter Solstice. Blue Moon – Four full moons in a season rather than the usual three. A second full moon in any given month. This results in a super werewolf similar to the Super Moon werewolf. The 13th Full Moon of the year in December nullifies the usual good Yule Moon and werewolves run rampant through Christmas when normally they’re dormant. Friday The 13th Full Moon – Causes demonic possession of werewolves. Demonic werewolves are the most violent and deadly of all werewolves. Only albino werewolves come in a close second followed by Super Moon werewolves. Super Moon – A Full Moon closest to Earth. Causes an extra powerful & aggressive hulked out werewolf. Lunar Eclipse – Causes physical werewolf de-transformation while maintaining their mental werewolf persona in human form going on serial killing sprees. It’s also rumored that the werewolf virus is vulnerable during an eclipse and there’s a chance for a cure with possible restoration of full humanity. Violet Moon – When a true Blue and Blood Moon coincide. A Violet Moon will cause a Werewolf to turn into Ash instantly only if directly exposed to the light. Transformation will safely occur courtesy of lunar energies if out of the light.